I think there has been an extensive role of wood shipping pallets in our daily life affairs. We have recycled a number of wood pallet furniture items for our homes, offices, gardens and kids play grounds. This participation has literally stretched away beyond our imagination. We never imagined to have such an active participation of these wooden pallet creations in our practical lives. So just to maintain the legacy set by this distinguished platform, here we are intending to use these shipping pallets in bathrooms. And let me assure you guys, you would simply love going through these ideas. 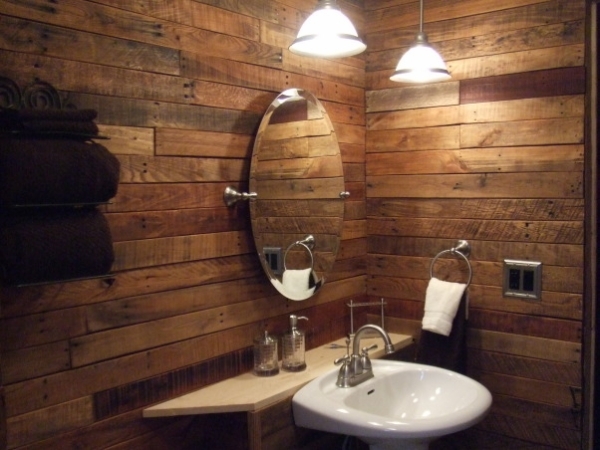 Starting with this bathroom pallet wood recycled is quite a professional approach. This is probably the most important supportive installation inside the bathroom. 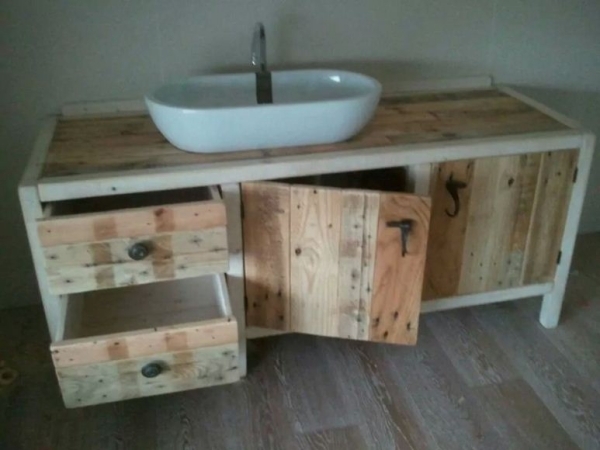 We have installed a built in sink inside this bathroom wood pallet cabinet, use it to place several bathroom accessories like your shaving kit, shampoo, soap and some other. 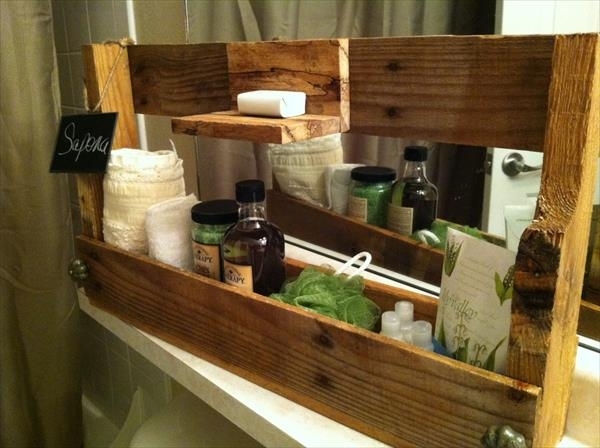 Giving an extensive shape to the same bathroom cabinet we ended up making this sleek and stylish wooden pallet beauty. Despite of its slim shape, its still pretty spacious for a number of accessories that you can place inside it. Though we were very specific in the selection of pallets while making this one. 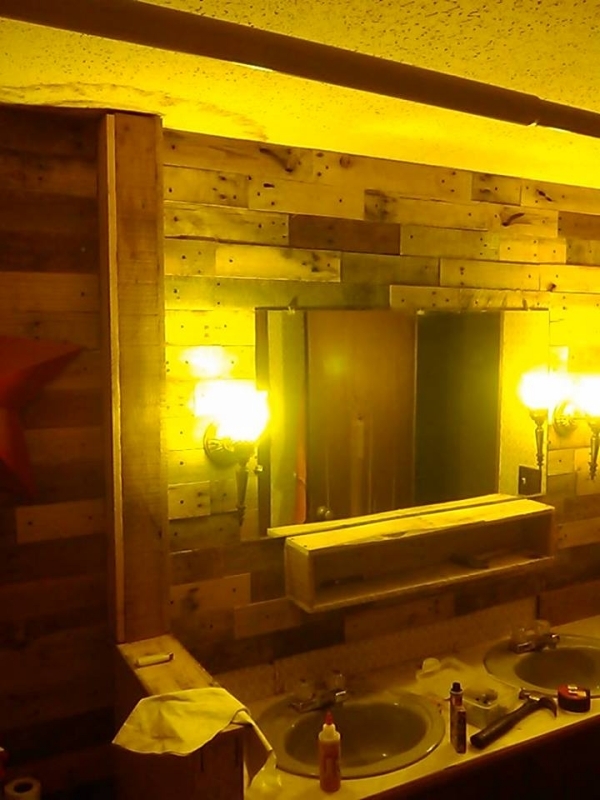 There is no limit to the art crafts, if you are smart enough to exploit some ordinary things, you can always end up making some wonders happen like here in this bathroom decoration project we see wood pallet planks all over the bathroom walls. 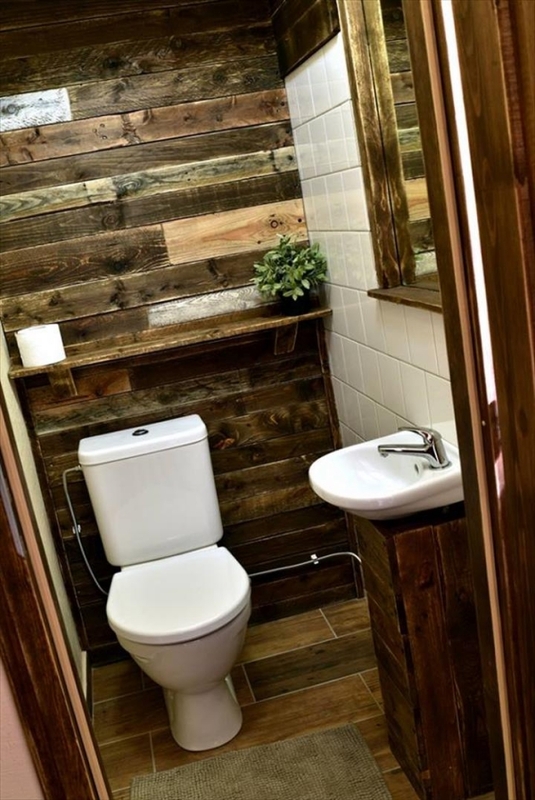 Here is another wood pallet extension inside the bathroom. 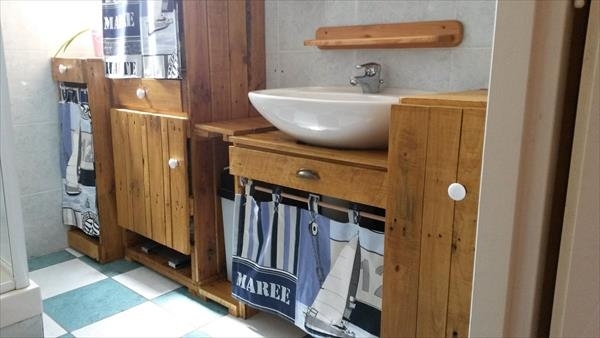 This is a delicate wood pallet bathroom cabinet with multiple drawers and segments. 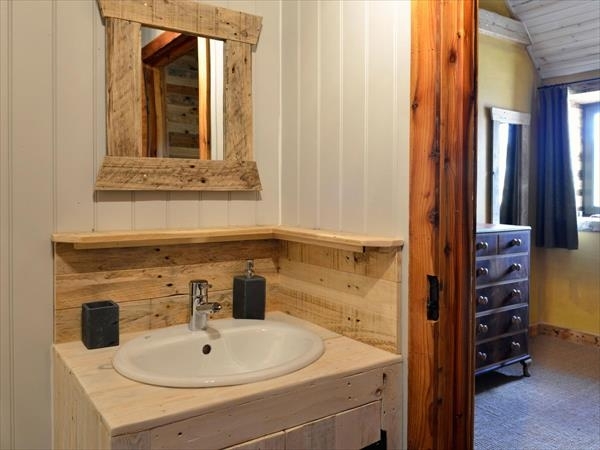 The fronts are covered with some fine fabrics, and decent white handles are adding much charm to the bathroom pallet wood installation. It has also got the built in sink. This is an ultra lavish bathroom decorated with some of the finest ceramic tiles. 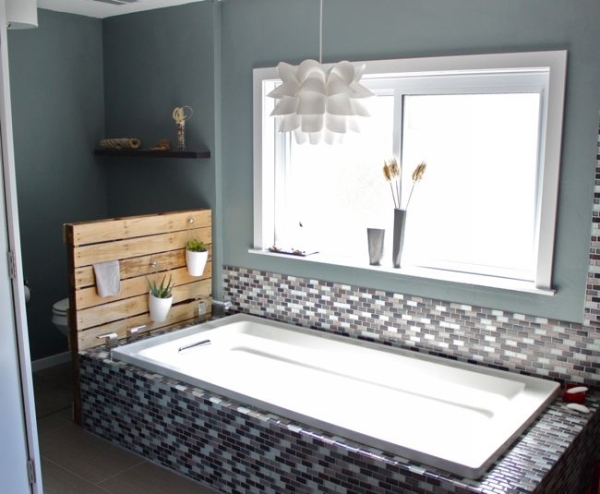 It has got a huge and wide window for some efficient outer look, while there is also a wooden pallet headboard on the back of Jacuzzi. Decorate it with some additional tiny planters. No need to go out there in luxury hotels just for some glowing and impact leaving installations when you have the wooden pallets in your hand and you are also familiar with the basic wood work. Create the same lavish atmosphere inside your bathroom by making such wood pallet wall shelf for some accessories you can’t place on regular shelves. 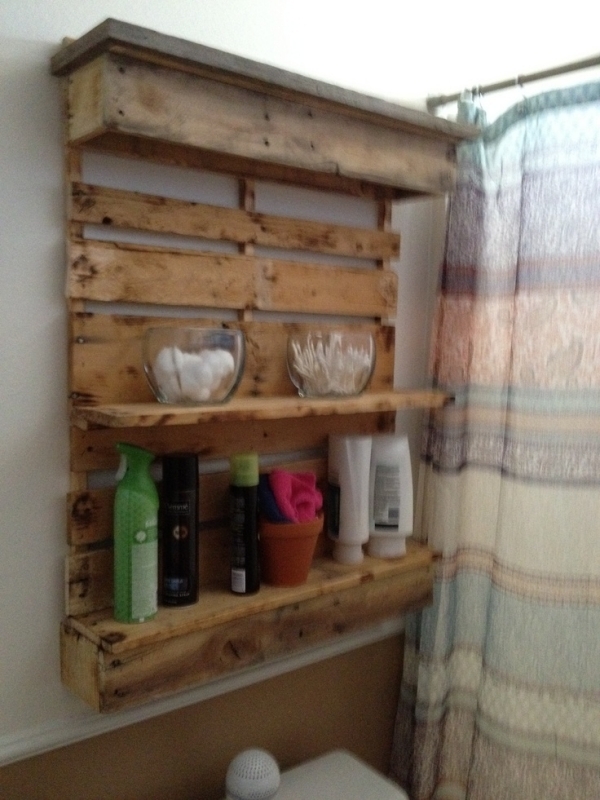 A wood pallet wall shelf for a bathroom could sound like a bit crazy idea, but there is no harm in that if you install it on a safe distance from water that might cause rusticity on the wooden object. But the moment you are done with it, the utility obtained out of it would simply be incredible. This one is just to show you that you must not always go for some expensive embellishments for your bathroom. 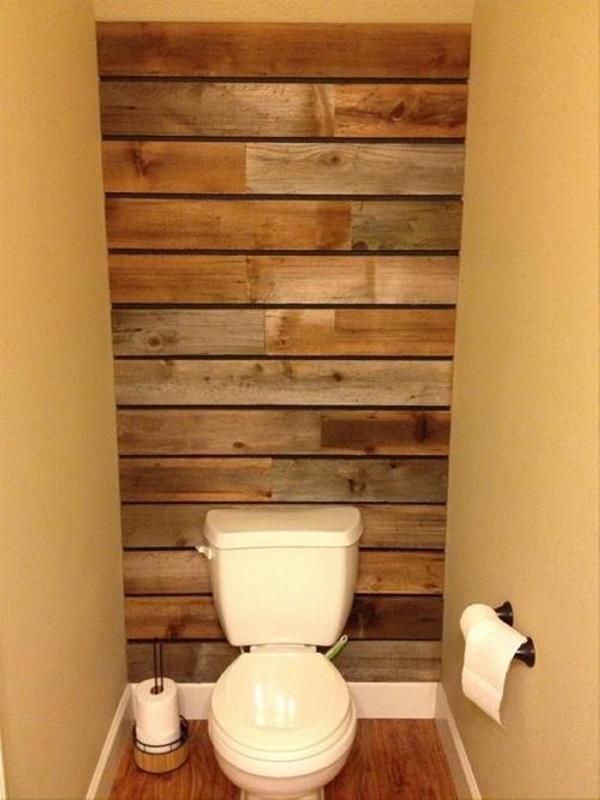 You can switch to this decent wood pallet wall decoration if you are bored from the conventional decorative plans. While making an accent wall with wood pallet planks, you just have to be cautious about the selection of shipping pallets. They must not be much deteriorated, rather fresh in appearance to give a perfect impact on your bathroom walls. And this would be one of the cheapest decoration techniques you can opt for. 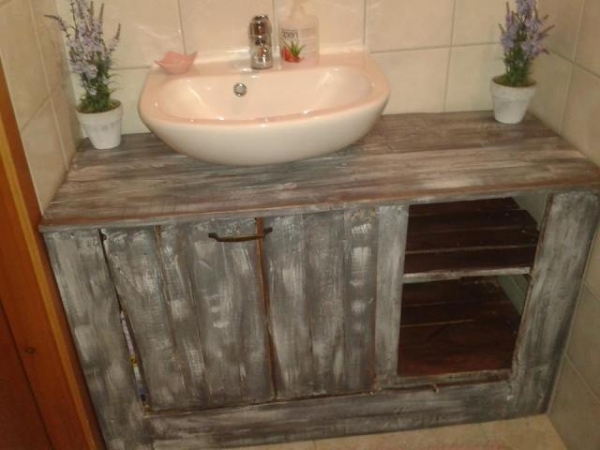 And coming to the next article in our discussion, this is the most rustic and roughest wooden pallet bathroom cabinet. The pallets are stained with mild strokes of white stain just to give an artistic look. But as far as the storage capacity is concerned, it is phenomenal. 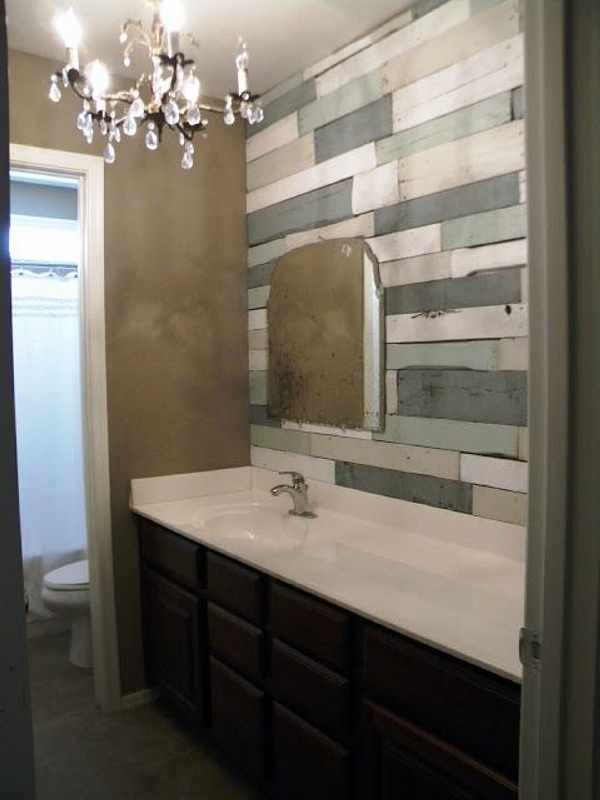 This is another classic example of wood pallet accent wall. 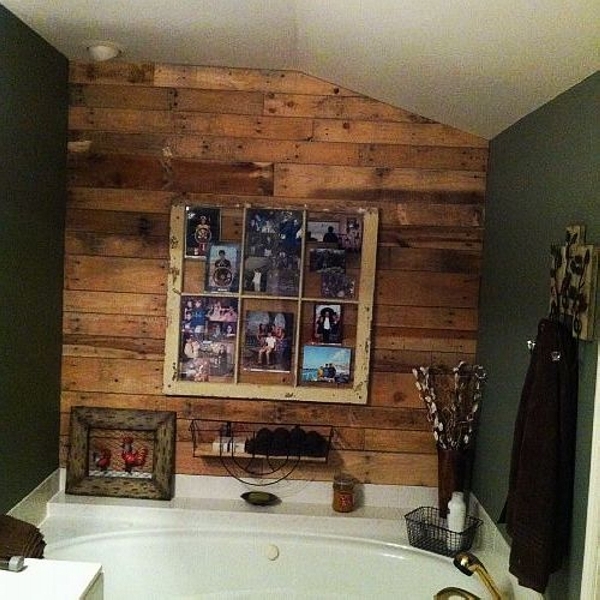 Wood pallet planks pasted on the wall with a pre set sequence are simply generating a marvelous optic inside the bathroom. Despite of clear scars of nails, this is yet a great art work that could be done using the cheap wooden pallet planks. 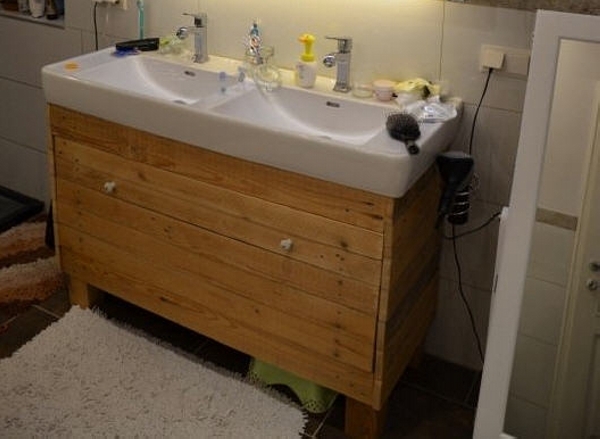 The final one is again a comprehensive demonstration of the fact that no matter how deteriorated pallets are you have in your possession, if you have a specially developed taste for art crafts, even such a roughest wood pallet installation would just do great in your bathroom.